V (played by Hugo Weaving) is stirring the political pot in a country that is ruled by an iron-fisted (totalitarian) government. V wants the people to wake up and question the government. To do this, he has chosen violence. One night, after curfew, V saves Evey (played by Natalie Portman) from being brutally raped, and possibly killed, by government thugs. That night, he and Evey hangout and end up on a roof to listen to some music and watch fireworks. The fireworks is the blowing up a building by V. The government is not happy, and the next day they find Evey at work. Luckily, V shows up again to save her, and he brings her to the only place that is safe for her…his home. From there….well you will have to rent the movie to see what happens. 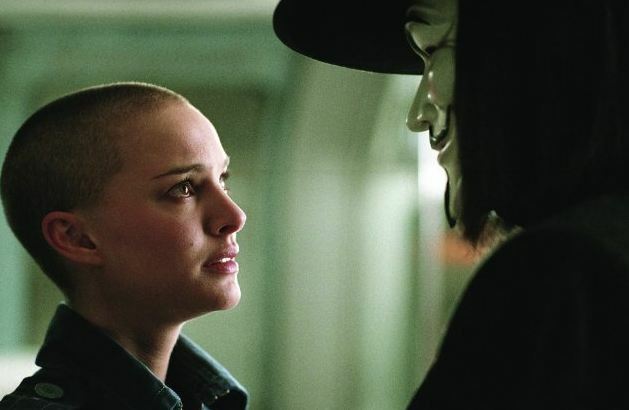 “V is for Vendetta” is a terrific movie. Gory, thrilling, and frightening. Not for kids, but, older teens and adults will love it (assuming the gore does not bother you).